When Denver’s leading developer collaborates with the city’s top food man, you know they’ll do something amazing. 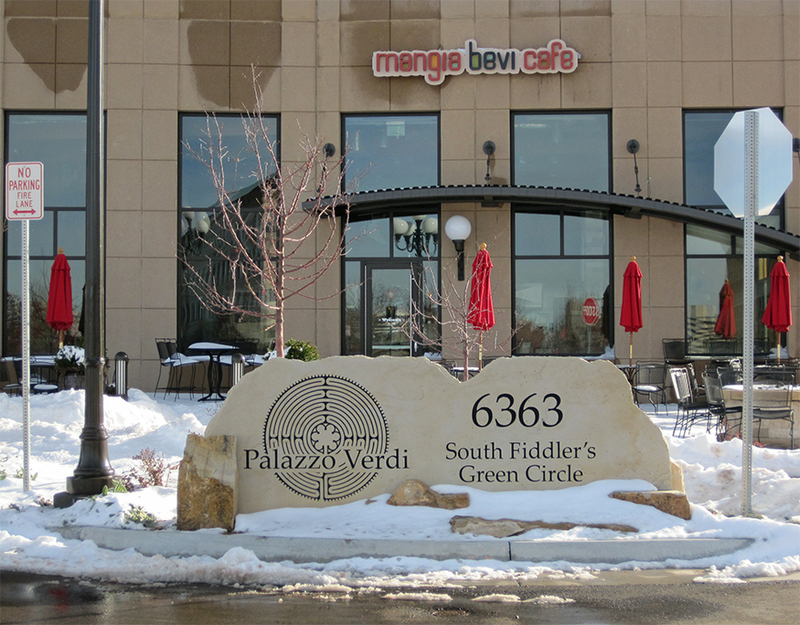 That’s precisely what happened when Denver Tech Center Developer John Madden asked Larry DiPasquale, CEO and managing partner of Epicurean Culinary Group, to operate a restaurant and catering services for his newest project Palazzo Verdi in Greenwood Village. Madden built the office building named for Italian composer Giuseppe Verdi, and DePasquale opened a wonderfully warm Italian bistro named for, well, eating and drinking. Mangia Bevi Café shares main-floor space with a stunning five-story atrium event center and Gallery at Palazzo, Madden’s latest offering to the city’s art scene. Indeed, the DiPasquale history is all over the place, in family photos, his aunt’s soup recipes, a burger named for son Rusty and Christina’s Macaroni & Cheese bearing his daughter’s name. And his father’s philosophy “Treat people like you want to be treated” is the overriding value that has carried Epicurean to the top of its field in 27 years, and will do the same for Mangia Bevi. The café is a light and airy trattoria with food services lined up on the back wall: a coffee and breakfast bar, a liquor and wine bar and an open kitchen. A comfy sofa grouping around a stone fireplace embedded with an ancient Celtic cross—one of Madden’s finds in Italy—invites light conversation. When talking requires privacy, the separate Venetian Room seats 22 at a long table in a more formal setting, perfect for board conferences and committee meetings. Chef Joshua Russell prepares all the contemporary lunch favorites at Mangia Bevi. From soups, salads and sandwiches to panini, pasta and pizza—there’s something for everyone. The most popular dish is Rusty’s Sicilian Burger with grilled salami, provolone, tomatoes, caramelized onions and sautéed mushrooms topped with basil mayo. Pizzas are Neapolitan thin-crust baked in a wood-burning oven; salads come piled high; Sticky Sweet Potato Fries are a meal in themselves; desserts include traditional Tiramisu and Canoli. Italians grow up with food and wine central to life and, especially, celebrations. DiPasquale and his gang want you to have a good time come un Italiano. So besides making you feel like one of the family, they’ve written reminders into the décor. Across the top of the kitchen a banner reads: Celebrations are brightest when food & vino are best. And in case you’ve forgotten: Life is a combination of magic and pizza. Other Italian phrases just make you smile: La Dolce Vita (the sweet life), Puro e Simplice (Pure & Simple), La Vita e bella (Life is Beautiful). The one with the most feeling is Non risica, non rosica (Nothing ventured, nothing gained) above a promise to remain true to the company’s five core values: amazing food, stellar service, nurturing community and relationships, going above and beyond, and passion for clients. DiPasquale’s passion for perfection means that his food is as fresh as possible—produce comes from local farmers and suppliers, and meats are from naturally raised animals. The exceptions are imports from Italy like tomatoes and flour for pizza dough. (Mark Dym from Marco’s Pizza got him hooked on Caputo flour). As in the catering side, everything is prepared from scratch on site, and you can watch it happen. “I wanted an open kitchen so guests can see the professionalism of our staff,” says DiPasquale, who recently was inducted into the Colorado Restaurant Association’s Hall of Fame, the first caterer to do so. He adds that honor to a long string of awards bestowed on him and his company during a lifetime career that began at age 14 in the kitchen of an Italian restaurant. His fascination with food grew as he watched his grandparents cook every Sunday. After college, he landed a job at Harrah’s Casino in Lake Tahoe where he eventually managed all of its 28 food outlets. His entrepreneurial spirit and love of the outdoor life led him to Colorado where he bought a small catering company at age 26, and the rest is Denver history. When you go Mangia Bevi Café 6401 S. Fiddler’s Green Circle, Greenwood Village 303-763-1981 www.mangiabevicafe.com Breakfast and lunch Monday through Friday 7 a.m. to 2:30 p.m.
MANGIA BEVI is a TrueItalianTable recommended authentic Italian restaurant. Denver native and third-generation Italian Claudia Carbone is an award-winning journalist who’s always looking for the perfect pizza.